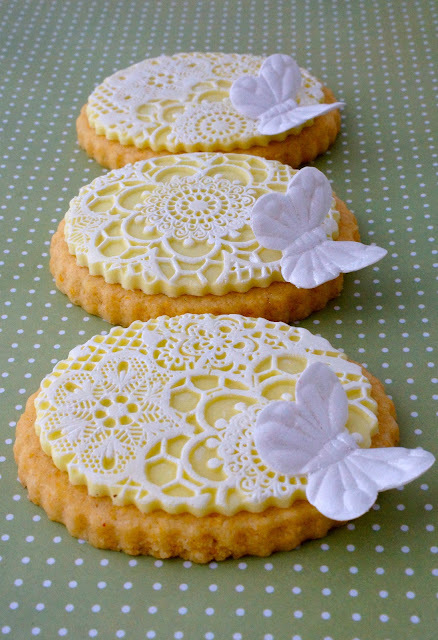 These little lace cookies, decorated with a sugar butterfly are some more lemon and polenta cookies. 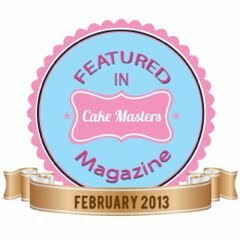 You can find my recipe for the lemon and polenta cookies here or see them decorated with a rose and lily of the valley springerle mould here. Sometimes a simple design can be very beautiful and a number of people have already said that these are their favourite of all the things that I have made. I am rather fond of their simple prettiness too. I see some sugar crafters who make lovely sets of slightly different and co-ordinating cookies, sometimes I try to do this, but I find it hard as I always like one of the designs a lot more than the others and one of them a lot less. These cookies, for me then are a departure from my norm, because although similar, they are not quite completely identical. 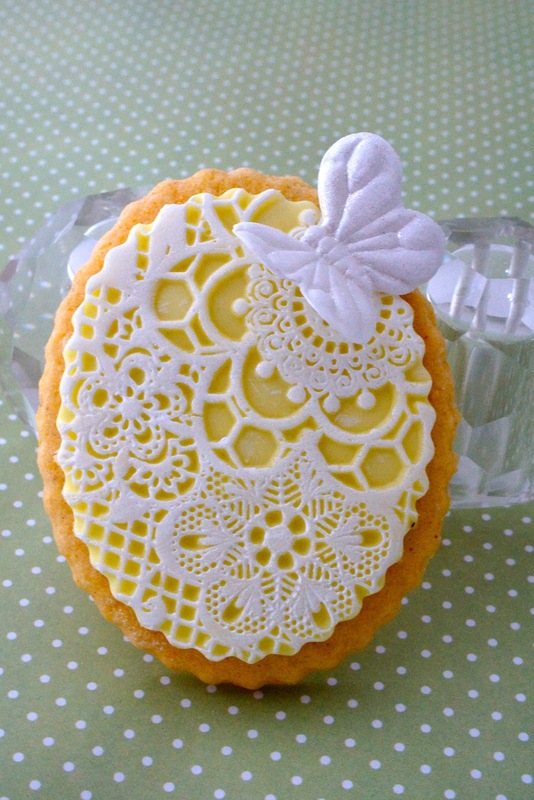 When I set out to do these, I was originally intending to make something like the cookie below, lovely fondant lace with spring time daisies. When I put the combination together though, it just wasn't quite what I wanted. This is my box of pretty little left over things. I don't know whether you have one of these at home, a little box where you store left over sugar flowers, bits and pieces, experiments, little practice pieces or things that you haven't quite had time to finish yet? 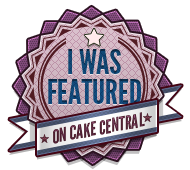 I delved into mine for inspiration of just what should decorate my cookie. In it I found some little white butterflies, tried them and found that they were just the look I wanted. Much happier with the butterfly. 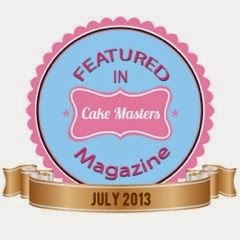 I came across this technique from the very amazing and lovely Carina Bentley. This is the first time I have put it into practice. Its actually easier than it looks. You must have come across the amazing Carina Bentley by now? If not go over to her Facebook page and also you'll find her picture tutorial on how to achieve what she refers to as The Magic White Lace effect. The silicone mat I have used here for embossing the fondant, is Bianca by Crystal Candy. 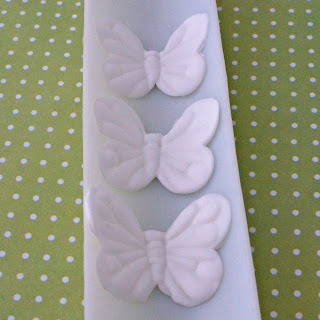 The butterflies are made using a cut and press set from Blossom Sugarart. I made mine using gum paste / sugar florist paste which means that they will dry hard and keep their shape when applied to the cookie. Start by greasing your work surface with a little vegetable fat (Trex / Criso). The vegetable fat helps the paste stick to your work surface, making it easier to roll and then helps it not stick when you need to lift it off. Roll your gum paste or sugar florist paste out quite thinly. Not too thin otherwise the butterfly wings will be prone to breaking off. Cut out the butterfly shapes then gently lift the cut-outs on to the press. Press the two halves of the butterfly press together to emboss the lovely pattern of the butterfly. Lift the butterflies off the butterfly press and place them into a flower former or a piece of cardboard folded into a "V" shape to shape the butterflies. Allow them to dry and harden up. About 24 hours is usually long enough. Sometimes white gum paste can look a little grey, especially when compared to the super white lace effect, so I took the opportunity to paint them with the left over white paint from the lace effect and then brushed them over with snowflake lustre for that lovely shimmery sparkle. 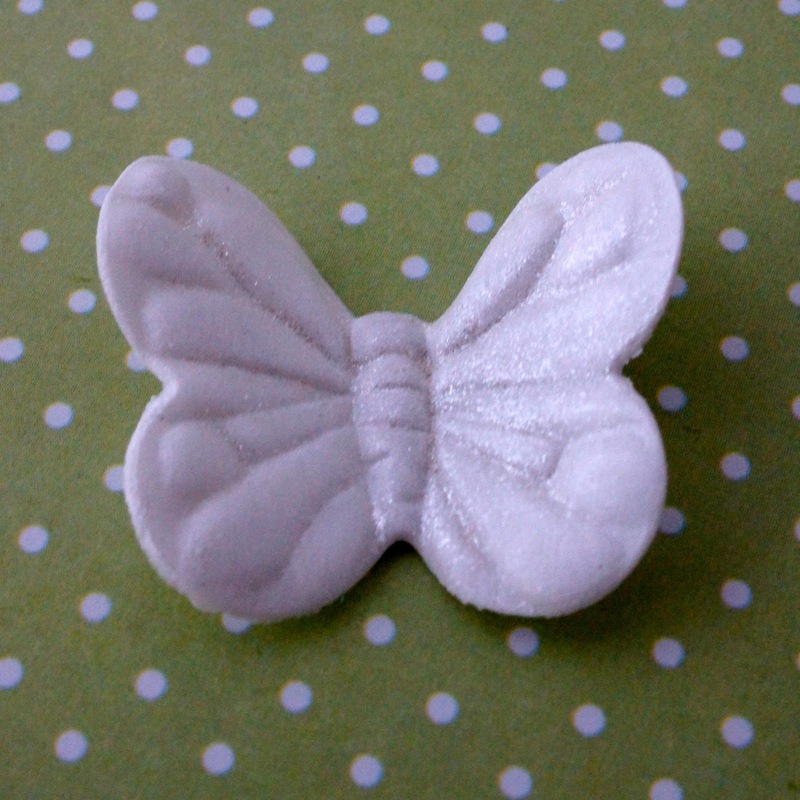 All that is left to do, is to place the Butterfly on to the cookie using a little edible glue to hold it in place.